There is no standard for bed sizes and they come in many different dimensions. Don’t worry though as mattress sizes are standard and each bed retailer will give you specific dimensions for each bed. The table below has all bed mattress sizes. The table also contains the corresponding size bed. If you click on the link you can view the bed and it will have the actual dimensions displayed. 6 What are IKEA & non standard mattress sizes? 7 About standard sizes in Europe? 9 What are futon mattress sizes? I was frustrated when I bought a mattress for my UK sized bed only to realise it was in fact the wrong size mattress. The name given for mattress sizes like ‘queen’ and ‘king’ don’t describe the actual size measurements. Also shops like IKEA don’t use the standard ratios. For the standard scaling of mattress sizes check the above bed mattress sizes chart which lists all the standard regulation English and mattress sizes that apply to foam, divan and sprung mattresses along with the measurements in a handy guide for use when you are choosing bed mattresses. If you are looking to purchase an IKEA mattress and are worried it might not fit the dimensions of your bed check out the IKEA mattress sizes guide to work out the scale of the mattress widths and mattress lengths as they aren’t regular to mattress sizes. If you are looking for bed sizes I’m afraid there isn’t a chart for this as there isn’t a standard for bed sizes they are all bespoke as I explained in my bed sizes page. Checking out the right length of mattress is especially important if you are a physically tall person. If you are under 6ft 6 inches then the typical larger size mattresses should be adequate to accommodate your longer body. The biggest standard mattress size is the Super King-size at 6 ft 6 inches or 180cm by 200 cm even bigger than a king size. If you are very tall however and more than 6 ft 6 inches then the best option would be to consider a custom bespoke mattress and bed which are available to make sure it’s comfortable enough. That is unless you don’t mind sleeping lying diagonally or with your feet hanging off the edges of the bed. I wouldn’t recommend this though unless you want to be making regular trips to a physical therapist. You will find that the standard mattress dimensions shown here will be too small to accommodate your body. Obviously upgrading the mattress will mean upgrading the bed frame too. Be careful if you intend on getting a bed with a footboard or a headboard as these will often mean the difference between a bed fitting your body length and not. If you go for a custom bed remember you will need to get custom bedding too that means custom fitted sheets and covers. To ensure that you get the comfort and a good night’s sleep you are looking for check the sizes and consider your body length before purchasing. Make sure it’s long enough for your height and wide enough to accommodate whomever is sleeping in the bed. The difference between the different standard mattress sizes could mean the difference between being comfortable compared with being uncomfortable. And that means not sleeping properly! Obviously your bedroom dimensions will also come into play but bear in mind that the bed itself will determine the space required not the mattress unless of course you intend to just use a standard divan bed base which will typically only be a fraction wider than the mattress itself. Standard bed sizes charts don’t exist as their are no standards for the bed. If you are using a standard box base then the size of the bed will be the same as the mattress. Bed dimensions aren’t standardised however any decent retailer like this one will detail the ranging dimensions of each bed. The standard king size bed mattress dimensions in metric are 150 cm (1 metre 50 cm) in width and 200 cm (2 metres) in length. The size in imperial is 5 feet in width and 6 feet 6 inches in length. This represents the standard full size typical dimensions in the . Any other dimensions such as width, height or weight will be entirely dependent on the manufacturer, construction and model of mattress. A king size mattress compared to a queen size mattress (also referred to as a small double mattress) is 30 cm wider and 10 cm longer in metric, 1 foot wider and 3 inches longer in imperial measurements. Be aware that these bespoke expensive beds and mattresses are often in their own unique sizing. So make sure you clarify the exact measurements before buying a mattress for the bed or vice versa. If you are making a quilt, throw, blanket, duvet or a bed runner you will need to know the mattress width which isn’t standardised so you will need to check with the retailer or manufacturer. Buying headboards or footboards will be dependent on your taste but they will need to be at least the width measurement mentioned above. As with bed sizes there is no mattress depth standard. Different types of mattresses will have different depths that range typically from 9 inches (22.86 centimeters) to 16 inches (40.64 centimeters) depending on how they are manufactured or the type of mattress construction. A pillowtop mattress with its extra layer of comfort will increase the depth further. The actual thickness of your mattress shouldn’t make a huge amount of difference as the effect can be offset by the height of the bed if you are looking to adjust for ease of getting into bed. Bunk beds are another thing altogether and you will need to look at the headroom required from the ceiling of your bedroom against the bunk bed height. If you are looking to buy bed sheets however you will need measure the dimensions and depth of the mattress. Dependent on the thickness of the bed you may also need deep pocket sheets to get the sheets to fit. What are IKEA & non standard mattress sizes? If you are looking for IKEA mattress sizes check this IKEA mattress sizes chart. 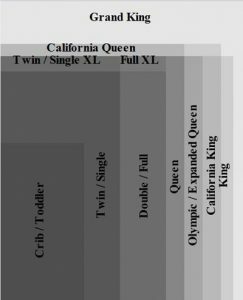 Many retailers will go much bigger than the king size and even super super king size increments mentioned above. Be warned that the king size bed dimensions will be significantly larger with certain retailers taking up a lot of space in your bedroom. Getting an extra long or full size mattress that will fit you might mean you need to get it custom made. There are retailers that will make both custom dimension beds and mattresses. If you are concerned with a hotel mattress size I would recommend checking with the hotel manager before you book or your feet might be hanging of the end of the bed! Children grow up fast so its best to provide something that they can grow into. There is little point in buying a small kids mattress when they will grow out of it increasing the price of the bed and mattress long term. About standard sizes in Europe? The above chart details standard mattress sizes and dimensions English mattress sizes. This is not a bed sizes chart, size guide for beds, bed dimensions chart or bed size scale as no standard existing and British beds area available in a huge variety of sizes just as they do in any other country. Looking for a British bed size guide, bed sizes in feet and inches or bed sizes in cm? I would suggest testing in person using some kind of measuring device as it isn’t a feature of the bed that needs you to find more space. Some shops have odd sizes using an odd European dimension or other special measurements. Be sure to clarify with the shop before you buy. All mattress brands in the will follow the above conventions so when you are buying consult this first and get your measurements before you buy your mattress. What are futon mattress sizes? Futons don’t use conventional sprung mattresses and have a folded mattress topper which forms the basis of the couch. There are many Futon producers many of which are completely custom made. As a result of this futon mattress sizes when extended into ‘bed mode’ don’t tend to follow any kind of standard mattress size format. As the mattress has been custom made for the futon frame if you want to buy a replacement mattress for the futon you will need to contact the original futon producer. When the futon is folded into ‘couch mode’ again there are no standard sizes. For each futon check with the futon supplier for size and dimensions when folded and when extended to a bed. Other bespoke beds such as trundle (also known as trumple beds, truckle beds or hurly-beds) will also need to be looked at on a case by case basis. The twin beds will need to be measured individually both the top bed and the slide out bed if it is being used as a bed rather than storage space. I am writing this just to be clear that there is no standard for bed sizes. Each manufacturer will have slightly different dimensions. It is wise therefore to check with the specific manufacturer or retailer before planning where to put the bed. Bed frames will also be slightly different by manufacturer. Bed mattresses on the other hand are standardised, if you are looking for this then head to our bed mattress sizes pages which contain mattress charts so you can compare the sizes. 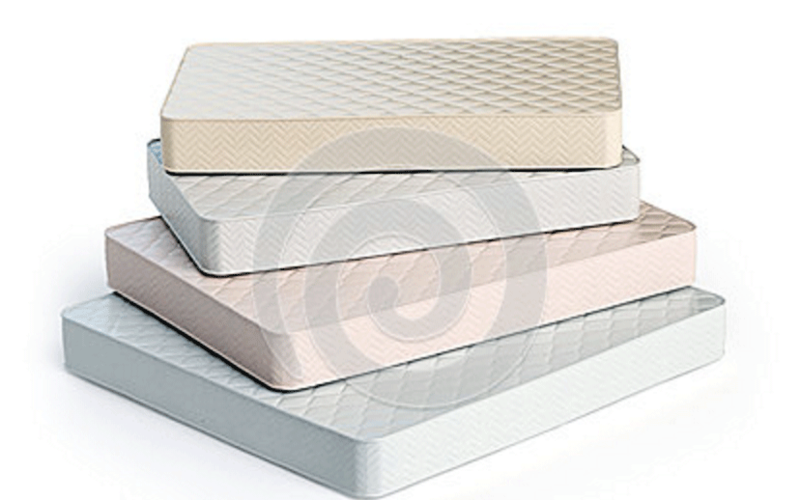 For a quick bed mattress size comparison check out our mattress size comparison page. Bed size comparison will need to be taken on a case by case basis. As mentioned below there are no standardised bed mattress sizes. The best thing to do is to go along to the store with the tape measure to get a true idea of what the dimensions are and then check the mattress size and measurements against the bed. Websites will sometimes quote the bed sizes but there may be odd elements to the bed that will increase the amount of space required. If you check the mattress sizes here against the bed fitting you will see whether it fits. If you are looking for bed size comparison source it is a bit tricky as there is no standard for bed sizes; they come in a huge range of shapes and sizes. What is standardised however is the mattress. A quick mattress size comparison can be carried out by checking the following graphic or check out our specific mattress sizes information. Be careful if you are buying an IKEA mattress as they use European sizes as detailed on our IKEA mattress sizes page. As with any bed the actual dimensions will be slightly different based on the type of bed. IKEA beds are no different so if you want to know the exact bed size its best to check with each model. Mattresses do however have a standardised sizing and IKEA beds are designed to fit European size mattresses not regular size mattresses. Check this page if you are looking for what size of mattress you need for an IKEA bed. The chart shows all of the standardised IKEA mattress sizes.